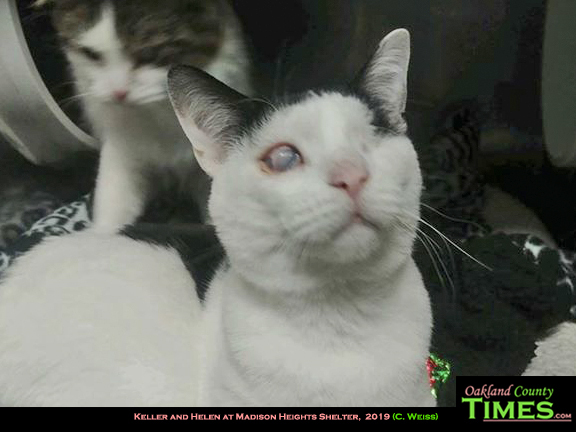 Madison Heights, MI- Keller was with his buddy, Helen, under a dresser on a hot August afternoon when the rescuers came. They were the last of many cats in the last room that Madison Heights Animal Control officers checked that day, removing multiple animals from a unkempt house packed with the belongings associated with hoarding. A house full of stuff and other hungry cats is scary enough, but when you’re blind too it can be a miserable situation. The dresser, at least, provided some security. The rescue was not an easy task. Once discovered, Helen and Keller ran around the room, the pair of them giving more chase than the other cats in the home combined. Yet when saving animals’ lives, the rescuers know it’s worth it. According to Justin Holland, Madison Heights Animal Control Officer, the seven cats and two kittens were infested with fleas. By the end of the day the legs of the animal control officers were all bitten up. Once the cats were safely in the shelter, they were treated for worms, upper respiratory infections, skin issues, and provided with healthy food, water, and clean litter boxes. Five of them were otherwise healthy, and were soon adopted into loving, forever homes. But for Helen and Keller, that wasn’t the end of the story. They are both sweet, loving, young cats. Helen and Keller are between two and three years old. Helen is a Domestic Medium Hair Tabby, and Keller is a Domestic Short Hair Black and White Tuxedo. Both are litter box trained, both are happy cats, and love to play. Yet, Helen is partially blind and Keller is almost totally blind. Keller can see some light and shadows, but that is the extent of his vision. Due to complications from untreated Feline Herpesvirus (FHV), Keller suffered interocular pressure in his eye, and had the eye removed. If that had not been done, he would have suffered pain like a persistent migraine. With the pressure in his eye gone, Keller is even more mellow and sweet than he was before surgery. Cats are incredibly resilient. While one might wonder how life in a hoarding situation might impact their personalities, or their potential for adjustment into a clean home with all their needs met. According to Holland, cats usually adapt easily and grow to become happy cats with their new families. If you watch a video of Keller online, you would not realize that he is blind. He leaps around, a black and white furry blur, plays with a toy, grabbing for it with his paws, and jumps in and out of a box. He is playful, has occasional small spats with Helen, but all in love. Boxes are his favorite thing! The shelter staff dropped an empty box from disposable gloves, and Keller pounced on it, grabbed for a small ball inside the box, and pawed around in the box in sheer feline delight. They went through four scratchers so far, Keller most enjoys toys with different textures, as he depends on what he can touch and feel for stimulation and play. Holland added that the shelter purchased a play set specifically designed for blind cats. Keller enjoyed it, but he played more with the glove box and the ball they put inside it! How does he do it, adapt so well and enjoys life like any other cat with sight? Holland explained that he relies on memory. Once he figures out where things are, he remembers. Also, and more importantly, he relies on Helen, who can see out of one eye. She guides him with her tail, showing him the way around until he is confident enough to be on his own. What does this pair of precious felines still need? They need you. They need to be adopted together into a loving forever home. If you love sweet cats who are affectionate, want to be petted, and want to sit on your lap, Keller is your man. He loves human attention and wants to be with you. If you prefer a more independent cat, one who is a bit standoffish, but very sweet and playful, that’s Helen. Love both? Perfect! Helen and Keller balance each other in personality, and they depend on each other. Their ideal home is one in which there are no other cats. A younger or submissive cat may work out, but preferably a home without other cats would be best for them. Adoption is easy – stop in to the shelter, fill out an adoption form, the staff will check your vet history, and after paying $120 for Helen and Keller, you can take them home with you. Suzette Gysel, Administrative Secretary for the Police Chief in Madison Heights, who formerly worked as an Animal Control Officer, and was involved in Keller’s rescue, said that Keller’s surgery was only possible because of donations from the public. The Madison Heights Shelter has a very small operating budget; they are funded by donations. The food the cats and dogs eat, the litter they use, the medical care they receive, they toys they play with, and all the other items provided to the pets in their care are all provided by generous donations from the community. If you are not able to adopt a pet right now, they would greatly appreciation any donations you can spare. You can check their Facebook page, Madison Heights Animal Control, their website on petfinder.com or drop off donations at the shelter. They are always in need of kitty litter (dustless, please), Kirkland dog food from Costco, cash, and fundraisers you would like to organize. They are located at 801 Ajax Dr., Madison Heights, MI 48071. UPDATE: there was a possibility that this pair may be adopted soon. If they are adopted, which would be the answer to many wishes and prayers from those who have met Helen and Keller since August, there are still many cats and dogs at the Madison Heights Animal Shelter who need forever homes too.